Delightful narrator, both witty and unintentionally funny... a twisty magical plot full of both humor and terror. — Pamela Dean, author of "Tam Lin and The Secret Country"
On Saturday, June 14, 2014, Muse Harbor Publishing's popular author of six published novels, Shalanna Collins, debuts her new Young Adult (YA) mystery novel with a magical twist, "April, Maybe June" at the Lucky Dog Books launch event in Dallas, TX from 11:00 - 1:00 p.m. Lucky Dog Books is located at 10801 Garland Road (just south of 635, between Easton Road and Jupiter). Collins will sign books and discuss her path to being a professional YA author. Muse Harbor will provide food and soft drinks at no charge to the public. Collins' clever YA novel "April, Maybe June" finds homeschooled siblings April and June Bliss inadvertently sucked into their older cousin Arlene's troubled life when the street-savvy 17-year-old disappears, then sends for their help via an inscrutable grimoire and a mesmerizing silver ring. When life turns supernaturally spooky, April and June must pull together to survive. 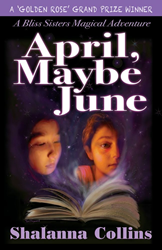 "April, Maybe June" is available on Amazon.com, BarnesAndNoble.com, iTunes and Museharbor.com in paperback and e-book versions. Muse Harbor Publishing will be offering a 15% discount. Click on museharbor.com and use coupon code: LUCKYDOG.